A quiet Mike Gygax didn't know what to say. Wednesday morning the El Dorado Hills Fire Department engineer was surprised at the Rotary Club of El Dorado Hills breakfast when Fire Chief Dave Roberts named him "Firefighter of the Year." "He's involved in just about everything we do," Roberts said in front of a crowd that included Gygax' wife, their two sons and a table full of fellow firefighters. "Over and over again I can rely on him." Roberts earned the "Firefighter of the Year" title himself in 2005. Gygax joined the department in 2001 and has "been instrumental in providing assistance at all levels of our organization, from the volunteer firefighters to the Budge Committee," Deputy Chief Jim O'Camb wrote in an e-mail to Rotary. "He is willing to lend a hand to anyone at the drop of a hat and he is respected by everyone." 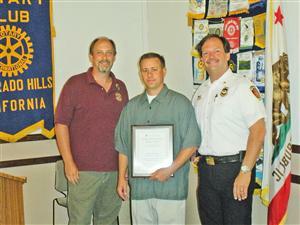 Rotary Club President Bill Tobin presented Gygax with Rotary International's Family and Community Service Award. A humble Gygax said away from the microphone, "I appreciate it. Thank you very much."